A new treatment approach for tackling urinary tract infection has been developed by researchers at the University of Southampton testing a treatment with a long established history in herbal practice. Antibiotic resistance is rising and it is a Department of Health priority to try and reduce prescribing antibiotics where possible. Resistance to antibiotics is a particular problem with cystitis (urinary tract infection). Cystitis in adult women is one of the most common conditions treated with antibiotics in primary care and although the symptoms are distressing, they usually settle without complications within a few days. Two alternative interventions for symptom relief have been identified - a commonly used over the counter anti-inflammatory drug and a herbal product Uva ursi. 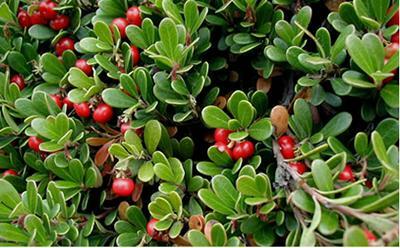 Uva ursi (Latin Name: Arctostaphylos uva ursi (L.) Spreng., folium), also known as bearberry or bear’s grape, is a plant found in North America, Asia and northern Europe. The herbal product is extracted from the leaves of the Uva ursi plant and has reported diuretic, urinary antiseptic and anti-inflammatory properties. Uva ursi has a traditional use dating back to the middle ages for many conditions including cystitis, urethritis and dysuria. It was first mentioned in the Welsh “Physicians of Nyddfai” in the 13th century. However the value of Uva ursi treatment in humans remains unproven, despite long-term use in folk medicine. The ATAFUTI clinical trial was developed to find out if either Uva ursi or a readily available anti-inflammatory drug can be used during a period of delayed antibiotic prescription to provide symptom relief. If so they would have the potential to change the way treatment is given and be used as an alternative to antibiotic prescribing. Over 300 women presenting to their GP with suspected cystitis will be asked to accept a ‘wait and see’ prescription for antibiotics and then randomly selected to take one or both of the two medications to reduce symptoms. Participants will be asked to take the trial medication and, if possible, not to take the antibiotics for 3 or up to 5 days. However, if their symptoms at any time get worse or have not improved after 3-5 days they will be advised to take the antibiotics. The study will record symptoms using a diary and the proportion of women using antibiotics in each group will be assessed. The research is funded by the National Institute for Health Research School for Primary Care Research (NIHR SPCR). The School comprises the leading academic centres for primary care research in England and their focus is on research to improve everyday practice in primary care. “We are really excited to be getting started with this study which hopes to identify ways of relieving symptoms of urinary infection without the need to resort to antibiotics” said Professor Michael Moore, who leads the academic unit of Primary Care and Population Sciences at the University of Southampton, is leading the study. The trial, run by the National Institute for Health (NIHR) funded Southampton Clinical Trials Unit (SCTU), located within Southampton General Hospital and University of Southampton’s Faculty of Medicine, involves 60 GP practices in the Southampton, Bristol and Oxford areas. “This clinical trial has just opened and has recruited its first patient. It will give us the evidence to determine whether new, and indeed old treatments, can be used as an alternative to antibiotics and could ultimately change routine practice in the UK,” said Professor Gareth Griffiths, Director of the Southampton Clinical Trials Unit.